The Arkel’s XM-28s are the baby brother to the similarly designed but more capacious XM-45s. 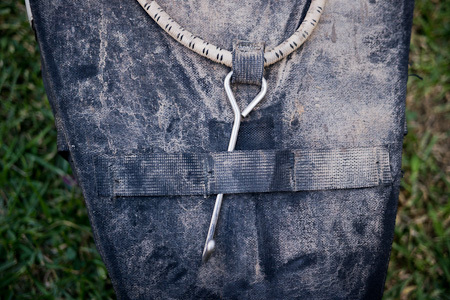 They cost $209 and according to the Arkel site, weigh 1.6kg. As the name suggests, they’re 28 litres in capacity for the pair – you can read the full Arkel blurb with all the spec details here. Tall ‘n slim. 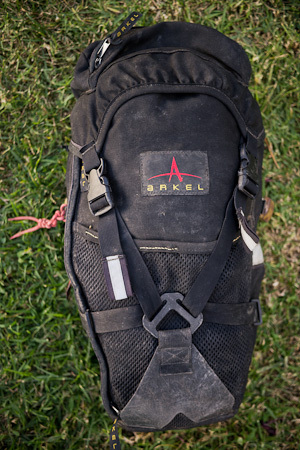 Arkel’s XM-28s are built for all the rugged mountain bike touring you can throw at them. Amazing clamping system that fastens to the rack with incredible kung-fu grip. These panniers have never hopped off – over the roughest, babyhead-strewn terrain – where other bags have. No sliding up or down the rack, either. Super tough build. And if anything get damaged or ripped, they’re easily repaired. Tall, svelte shape that keeps the bike’s profile slim, which is good for rocky trails, windy conditions and heel clearance. 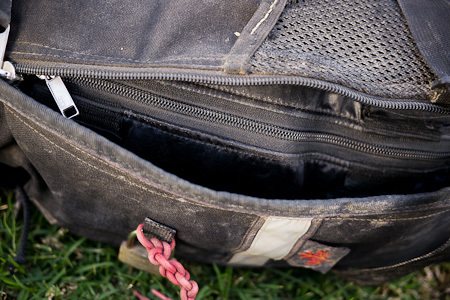 Chunky, reliable outer zips that offer easy side access to gear buried deep within. 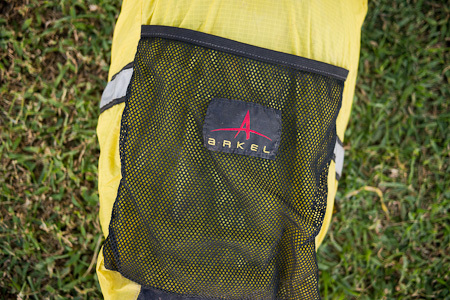 Arkel’s pannier within a pannier system also means extra compartmentalisation for wet stuff like waterproofs. This works very nicely. Useful top pocket and side mesh pouch. Organisation-heads will appreciate these touches. 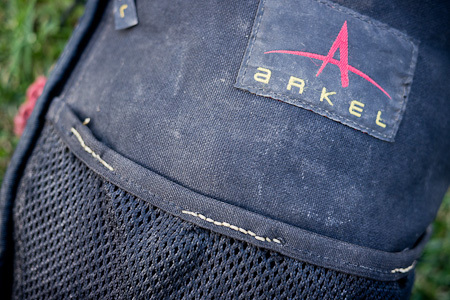 Constructed from Cordura, the Arkels are also breathable. Damp clothes won’t ending up stinking too bad, unlike a seam-sealed, watertight rolltop pannier. The bright waterproof covers offer extra visability. At 28 litres a pair, these are roomy bags, and make a good option for running at the rear too. Considering the hefty price tag, it’s a shame neither waterproof covers nor a shoulder strap are included. Those waterproof covers mean more bulk, plus a touch more weight when stored wet. And, you’ll definitely be needing the covers for long, heavy rains/monsoons. Even when fitted, I’d hesitate to call the XM-28s 100% waterproof – gear at the bottom will eventually become damp over prolonged rain storms (I pack my computer in a watertight sleeve). To be fair, I should add that outside of monsoonal downpours or negotiating river crossings, your stuff will most likely stay bone dry. The occasional spray of Nikwax would probably help too. 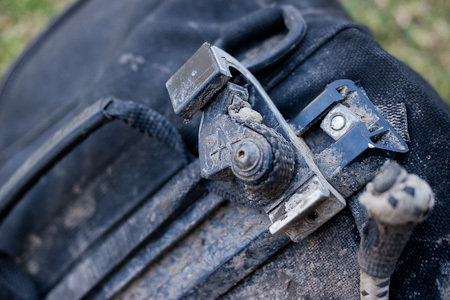 While the panniers secure very effectively to the rack, the old fashioned bungee and hook system mean these panniers can flap outwards like dog ears over rough descents. Some kind of anti sway clip would be useful. 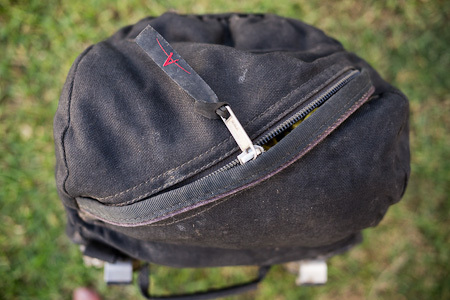 Dust and grime can’t be conveniently hosed off like a rolltop pannier. However, I prefer the low key and weathered look over the bright and shiny finish of PVC panniers. Using the waterproof covers also helps protect them. Not so much a dislike, but something to be aware of. Like the XM-45s, these panniers pack high. If you’re running them at the back, stacking up a rucksack or rollbag across them doesn’t really work. First off, the XM 45s are neither cheap ($209) nor light panniers (1.6kg, plus raincovers). But they are tough, and packed with details I’ve come to really appreciate over my travels. For these reasons I still think they’re good value for money. The main question adventure touring nuts are going to ask is: are these Arkels better than equivalents from German waterproofing specialists Ortlieb? As if often the case with a direct comparison, there’s not a straightforward answer. Their approach to pannier design is very different – and which suits you better depends on what you value most. If quick to use, simple 100% waterproofing is your priority, Ortlieb’s rolltop models won’t disappoint. They’re very well built and completely H2O tight, whatever the weather – which is a real bonus if you’re packing anything electronic. The basic roll top versions are a lot lighter too. But if stability, breathability, compartmentalisation, detail and repairability tick your boxes, then the Arkels come out top. I love the attention that’s gone into these panniers. All kit gets damaged or wears out in time – the XM28s feel like they’ll outlast their competitors and keep lugging my gear around for many miles to come. Kung Fu grip from Arkel’s superb adjustable mounting system. The built in rubber inserts stop the panniers sliding up and down. I’ve ridden some very rough trails, yet these panniers have never leapt off my bike. Popping them off when you need to is easy. The simple bungee and hook works fine, but the panniers do flap outwards like dog ears. Two chunky outer rear zips provide easy side access, and double up as a separate space for stashing damp waterproofs or a pair of Crocs, away from the contents of the inner compartment. The elasticated lid means you can stuff in those extra layers when you overheat – perfect for Andean climbs. The scuffplate is, as you can see, well scuffed. 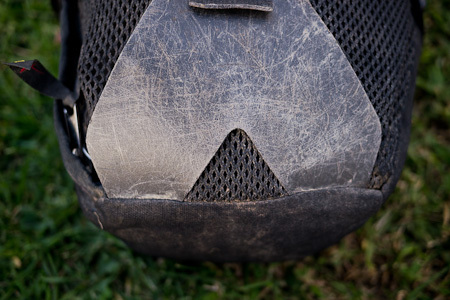 It protects the netting from scratches against walls or rocks, while the cross straps keep the load stable when riding off road. Over the many months I’ve been travelling I’ve had to repair them in a few places. I should also add that the stitching on my XM-45s has given away in a couple of places too. While this is hardly ideal, twenty minutes with the ever useful Speedy Stitcher and they’re as good – if not better – than new. Easy repairability is a big plus point, as all kit gets damaged or wears out in time. 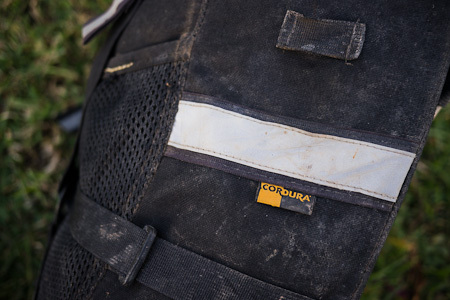 Front and rear reflectors, a light clip and hardwearing Cordura are some of the quality finishes on these panniers. The top compartment is handy for bits and pieces you need quick and easy access too. The XM45s have handy rear compartments too, great for stashing food, or an extra water bottle. The waterproof covers are a real must if you’re hitting a rainy season. Finished in neon yellow, visibility is good and the elastic mesh pocket is a nice touch. I often slip the covers on in cities too, making access more awkward for any light fingered, would-be thieves. A minor downside is the extra space needed to stash them. This entry was posted in Gear and tagged Arkel, review, xm28, xm45 on July 5, 2011 by Cass Gilbert. 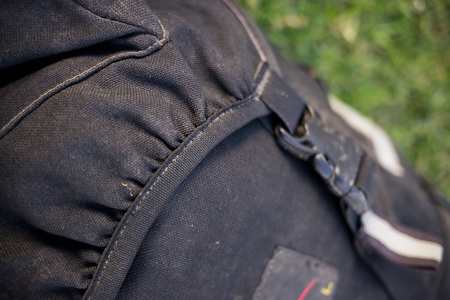 They look really nice (I love the way well worn Cordura ages) – everyone I’ve met with Arkle panniers speaks highly of them, although personally I’m not a fan of too many pockets (because i’d end up stuffing them with junk). Just a question though – is it necessarily a good thing that they hold so tightly to the rack? Won’t this make it more likely that you’ll damage the rack in a fall? I once had a spill in Vietnam that I’m pretty sure would have totaled the racks if the Ortliebs hadn’t sprung off on impact as designed. oops, I mean ‘Arkel’, not ‘Arkle’. Hm. Maybe, but I think I prefer the idea of them staying on… Ejecting mid descent isn’t ideal… The panniers of one guy I was riding with kept popping off, and ended up tearing..
Glad to see that you like the XM series. At the time I designed them to work best on a mountain bike (because of the frame dimensions and such), but of course they can be used anywhere. Maybe you could ask Paul (at Arkel) to try to improve on that point?